For a mechanical device that produced sparks used for lighting in mines, see Mechanically_powered_flashlight § "Steel_mills". Integrated steel mill in the Netherlands. The two large towers are blast furnaces. Since the invention of the Bessemer process, steel mills have replaced ironwork, based on puddling or fining methods. New ways to produce steel appeared later: from scrap melted in an electric arc furnace and, more recently, from direct reduced iron processes. In the late 19th and early 20th centuries the world's largest steel mill was the Barrow Hematite Steel Company steelworks located in Barrow-in-Furness, United Kingdom. 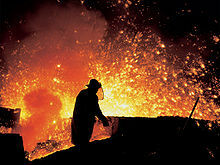 Today, the world's largest steel mill is in Gwangyang, South Korea. The principal raw materials for an integrated mill are iron ore, limestone, and coal (or coke). These materials are charged in batches into a blast furnace where the iron compounds in the ore give up excess oxygen and become liquid iron. At intervals of a few hours, the accumulated liquid iron is tapped from the blast furnace and either cast into pig iron or directed to other vessels for further steel making operations. Historically the Bessemer process was a major advancement in the production of economical steel, but it has now been entirely replaced by other processes such as the basic oxygen furnace. Molten steel is cast into large blocks called blooms. During the casting process various methods are used, such as addition of aluminum, so that impurities in the steel float to the surface where they can be cut off the finished bloom. Because of the energy cost and structural stress associated with heating and cooling a blast furnace, typically these primary steel making vessels will operate on a continuous production campaign of several years duration. Even during periods of low steel demand, it may not be feasible to let the blast furnace grow cold, though some adjustment of the production rate is possible. Integrated mills are large facilities that are typically only economical to build in 2,000,000-ton per year annual capacity and up. Final products made by an integrated plant are usually large structural sections, heavy plate, strip, wire rod, railway rails, and occasionally long products such as bars and pipe. A major environmental hazard associated with integrated steel mills is the pollution produced in the manufacture of coke, which is an essential intermediate product in the reduction of iron ore in a blast furnace. Integrated mills may also adopt some of the processes used in mini-mills, such as arc furnaces and direct casting, to reduce production costs. A minimill is traditionally a secondary steel producer; however, Nucor (one of the world's largest steel producers) and Commercial Metals Company (CMC) use minimills exclusively. Usually it obtains most of its iron from scrap steel, recycled from used automobiles and equipment or byproducts of manufacturing. Direct reduced iron (DRI) is sometimes used with scrap, to help maintain desired chemistry of the steel, though usually DRI is too expensive to use as the primary raw steelmaking material. A typical mini-mill will have an electric arc furnace for scrap melting, a ladle furnace or vacuum furnace for precision control of chemistry, a strip or billet continuous caster for converting molten steel to solid form, a reheat furnace and a rolling mill. Originally the mini mill was adapted to production of bar products only, such as concrete reinforcing bar, flats, angles, channels, pipe, and light rails. Since the late 1980s, successful introduction of the direct strip casting process has made mini mill production of strip feasible. Often a mini mill will be constructed in an area with no other steel production, to take advantage of local markets, resources, or lower-cost labour. Mini mill plants may specialize, for example, in making coils of rod for wire-drawing use, or pipe, or in special sections for transportation and agriculture. Capacities of mini mills vary: some plants may make as much as 3,000,000 tons per year, a typical size is in the range 200,000 to 400,000 tons per year, and some old or specialty plants may make as little as 50,000 tons per year of finished product. Nucor Corporation, for example, annually produces around 9,100,000 tons of sheet steel from its four sheet mills, 6,700,000 tons of bar steel from its 10 bar mills and 2,100,000 tons of plate steel from its two plate mills. Since the electric arc furnace can be easily started and stopped on a regular basis, mini mills can follow the market demand for their products easily, operating on 24-hour schedules when demand is high and cutting back production when sales are lower. ^ "Barrow". Ironbridge Gorge Museum Trust. Archived from the original on 2007-08-19. Retrieved 2007-08-25. McGannon, Harold E. (editor) (1971). The Making, Shaping and Treating of Steel: Ninth Edition. Pittsburgh, Pennsylvania: United States Steel Corporation. Wikimedia Commons has media related to Steel mill.